The notoriously reclusive Alan Moore talks with us about Harvey Pekar’s influence, quantum physics, Frank Miller’s rant, why he usually avoids the Internet, and his unprecedented videoconference to raise Kickstarter cash for a Pekar memorial statue. Alan Moore authored what many consider the seminal graphic novel of the 20th century, Watchmen. 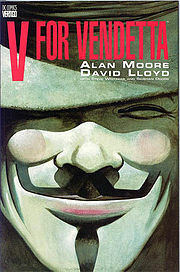 His masked V for Vendetta character has become the adopted logo of the Occupy movement. His layered epics court the esoteric and fantastic. So the last person you’d imagine the droll Englishman would turn to for inspiration was a nebbishy Cleveland writer reveling in the mundane. 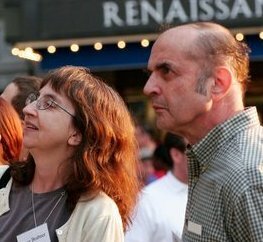 Yet for nearly a quarter century until his untimely passing last year at age 70, Harvey Pekar–who created the autobiographical American Splendor comics that inspired the 2003 film starring Paul Giamatti and Hope Davis–was among Moore’s closest friends. The pair bonded over blue-collar backgrounds, old books, and a wariness of Big Brother. 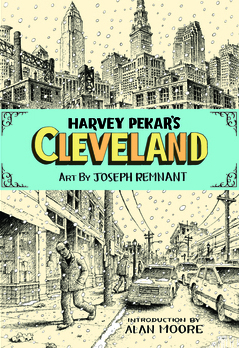 Even death hasn’t stopped their collaboration: Pekar’s sensibility is informing Moore’s current novel, Jerusalem, while Moore penned the introduction to Harvey Pekar’s Cleveland, Pekar’s posthumous graphic novel (illustrated by Joseph Remnant) that’s due in March. And, most notably, the notoriously reclusive Moore has agreed to a multi-hour online videoconference with contributors to a Kickstarter fundraiser for a Harvey Pekar memorial statue at the Cleveland Heights-University Heights Public Library, where Pekar often wrote. 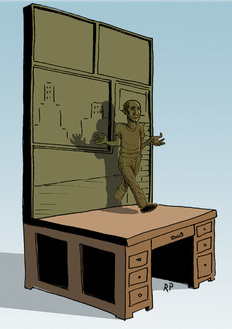 Slated for an October opening, the whimsical statue will feature Pekar emerging from a comic page, with chalkboard panels on the back for kids to draw their own comics. Despite exceeding its $30,000 goal, more donations are needed by the Dec. 5 deadline to cover taxes, the Kickstarter commission, prize shipping and handling, and enhancing the library’s comics collection. Moore and Pekar met in the late ’80s, through Brabner. 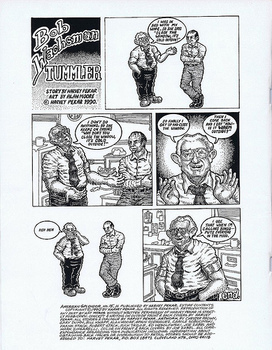 Moore drew a page for a 1990 issue of American Splendor (at left), and later appeared as a character in it when Pekar and his family traveled to England to visit. What Pekar represented to Moore were the small heroics of making one’s way in life, of stealing quiet victories against a backdrop of disappointment and disadvantage. “Harvey came from Cleveland, where the creators of Superman came from,” says Moore. “But Harvey represented a very different kind of hero that exists in real life. Moore regards his “superheroes” more as vehicles to explore societal constructs and abuse of power, with final judgments left to the reader. In V for Vendetta, “It doesn’t matter who’s behind the mask–he’s an idea. That factor has made the V identity such a useful tool in the Occupy protests,” he says. “Watchmen was a meditation on different sorts of power that exist in the current world. He tested those ideas gingerly at first, setting his 1991-6 comic book series From Hell in a detailed 19th century London, before placing his first prose novel, in 1996, Voice of the Fire, in Northampton. (“I found it a much richer subject matter than any of the science fiction landscapes I’d created,” he says.) Pekar’s voice is very much alive as Moore crafts his current novel, Jerusalem, which engages a history of Northampton, though woven among angels, demons, ghosts, historical figures, and an ethereal contemplation on the quantum view of time as simultaneous occurrences rather than linear sequence.